Choosing your absinthe glasses can a lot of fun. ​There are many styles to choose from so let's look at the terms used to describe absinthe glasses. Most common terms you'll see when choosing your absinthe glass. The style of Glass that has a Reservoir or Dose-Mark is used to assist in mixing absinthe with water. The glass is filled to the dosing line or the reservoir is filled with Absinthe and water is used to fill the rest of the glass. The most popular reservoir absinthe glass is the Pontarlier. 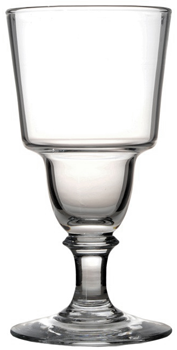 The most popular Dose-Marked absinthe glass style is the Versailles. The dose-mark or reservoir is only a suggestion as to how much Absinthe to use. The plain glass has no mark to suggest the amount of Absinthe to add to your glass. Popular styles of the standard glass include the ﻿﻿Tarragon﻿a﻿, Lyonnais and Bistro. ​Mouth Blown Absinthe Glasses are more delicate, lighter in weight and tend to cost more. Although they are thinner and lighter, they can still be as rugged as molded glass. When buying blown absinthe glasses, look for crystal or borosilicate glass as these tend to have strength and are aesthetically pleasing. Molded absinthe glasses are thicker and heavier and are usually much less expensive than blown glass. Molded glasses are also very rugged and hold up well for commercial purposes. Image: Left is a blown, Pontarlier absinthe glass and right is a molded, Pontarlier absinthe glass. Notice they both have a reservoir for measuring the correct amount of absinthe for your glass. Some Absinthe glasses have a reservoir or small "bowl" at the bottom of the glass. There are also absinthe glasses with a line molded into or drawn on the glass. Absinthe Glasses with Reservoirs or Dose Lines are used to measure your dose of absinthe. Dose lines and reservoirs usually measure between 1 and 1.5 ounces. This is of course just an approximation. You may prefer more or less absinthe. Absinthe is usually mixed 1:3 to 1:5 with water. ​Image: Left is a molded, dose line Versaille absinthe glass and right is a blown, bubble reservoir absinthe glass. Can you tell by looking which absinthe glass is molded and which is blown? ​To prepare an absinthe correctly, you must slowly drip water over your absinthe spoon holding a sugar cube into the glass. This is usually done with a carafe or absinthe fountain. But there are other options to aid the slow addition of water to your drink. Without a fountain or carafe, mixing absinthe can be difficult and time consuming. An absinthe Dripper or Brouilleur is a small bowl with tiny holes in it. You place the absinthe dripper on top of your glass and fill it with water. The dripper slowly adds the water to your absinthe glass for you. 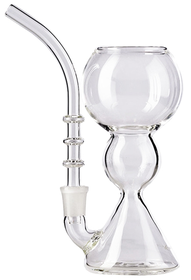 ​Absinthe Drippers are available in many styles and sizes with some having a mechanical action to drip the water. ​​Absinthe Sipping Pipes are used to drink absinthe mixed with water or straight. They are small glass "pipes" that are filled with absinthe, with or without water and ice, and sipped slowly. They generally hold about 2-3 ounces. Some pipes allow you to louche your absinthe directly in the pipe such as the SlipStream Absinthe Glass pipe at left. Like most pieces of Absinthiana, absinthe sipping pipes pipes come in many styles and sizes.